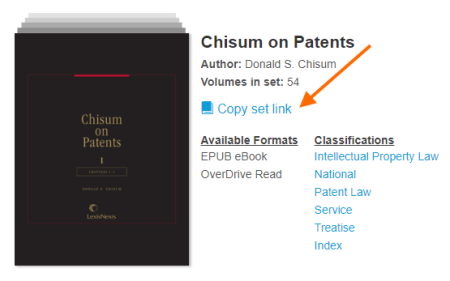 In the most recent LexisNexis digital library release, we added a new Share button that you'll see in multi-volume searches next to borrowed volumes. When you select Share, you copy a link to the passage that you can share with your colleagues. If the person you're sharing the passage with hasn't borrowed the title, they'll be prompted to check it out (or place it on hold). Where can I find more information about a title? You can find additional information about a title on your LexisNexis digital library by going to its details page. To go to a title's details page, click or tap beneath the title, then select More info. 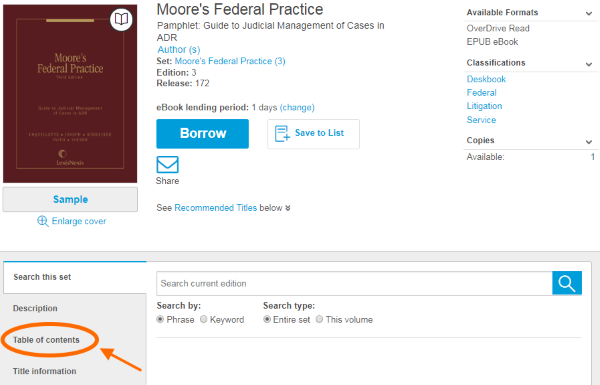 Or, select the title of the book to access its details page from search results. On the details page, you'll have options to Borrow or Place a Hold on the title, read or listen to a sample, save the title to your list, share the title, and more. 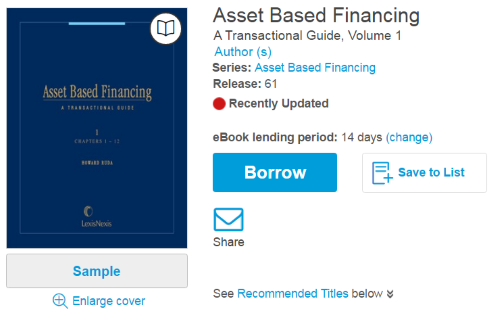 If the title is part of a set, you'll be able to search the full text of the set to find the volume you need before borrowing. How do I explore multi-volume sets? You can use multi-volume set pages to explore supported sets in your LexisNexis digital library. Search for a phrase or keyword across all volumes in the set. Note: Multi-volume search is also available from individual title details pages. Borrow or place holds on any volume in the set. Select Copy set link to share the page with your users or colleagues. This will copy the page's link to your clipboard, making it convenient for you to share. You can easily find the volume(s) you need in a set by searching the full text of the set before borrowing. Note: Searching only returns results in the current edition of the set. Go to any multi-volume set page or the details page of any volume in a supported set. Locate the Search this set option beneath the set or volume. Enter a term in the search box and set your search parameters. Note: Select Phrase to search for more than one word at a time (for example, "jury duty") or Keyword to search for each word individually ("jury" and "duty"). Each result includes relevant passages and the option to Borrow or Place a Hold on the volume. Once you check out a volume, you can select Go to... to open the book in your web browser and go directly to your search result. You can also select Share to copy the link to your search result, then share it with a colleague. To make it easier for you to find, we'll automatically highlight the search result in your browser (and sometimes a few additional characters). If you search for a longer phrase, it may be partially highlighted. 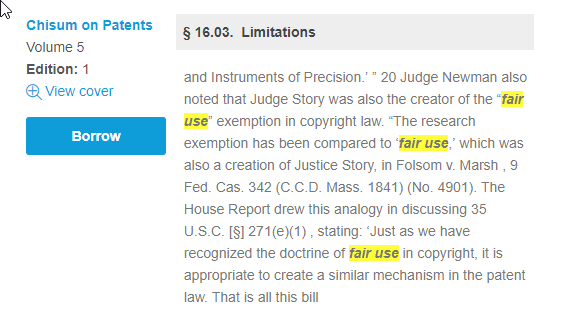 In your LexisNexis digital library, titles that have been updated in the past two weeks are marked with a red dot and a "recently updated" label. 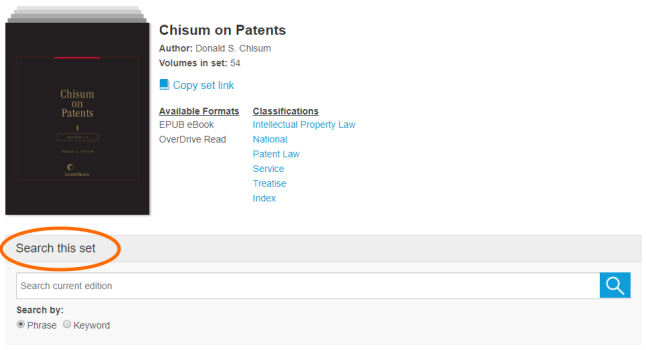 LexisNexis keeps a list of all new and recently updated titles on their website. Please note that your LexisNexis digital library may not own all of the titles listed, and some titles may not be available to recommend. You can view an eBook's table of contents before you borrow it by going to the title's details page and selecting the Table of contents. For a multi-volume set, the "Table of contents" tab displays the complete table of contents for the set. Where can I find index volumes for multi-volume sets? 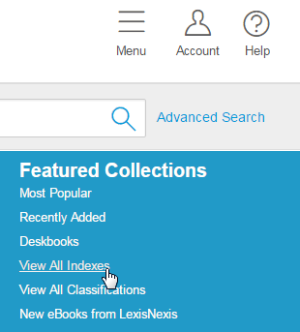 You can see all of the index volumes in your LexisNexis digital library by selecting Menu, then View All Indexes (under "Featured Collections"). From the Indexes page, you can find a specific index by searching within the results, or you can narrow the results by format, availability, and more. 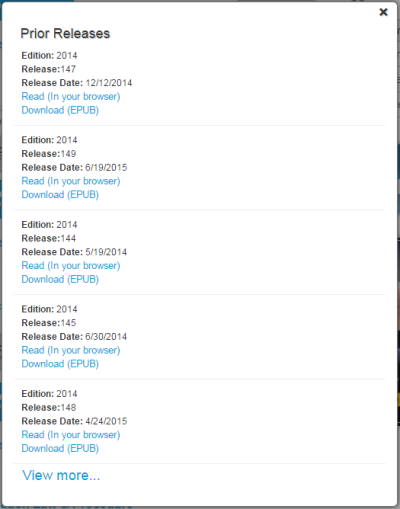 You can find a list of prior releases for any eBook (that has prior releases) on the title's details page. Under "Release Information," select Prior Releases to bring up a complete list. 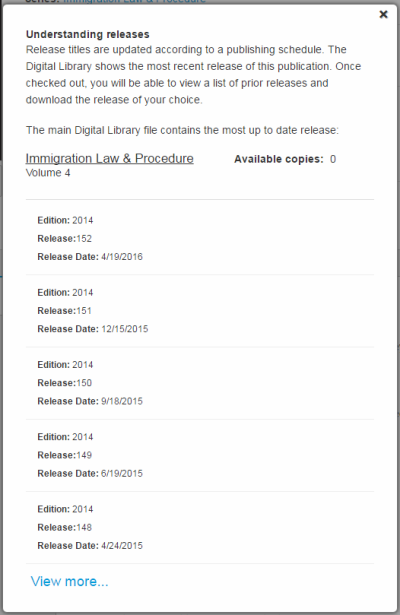 This list displays the release date for each prior release and includes a link to the most up-to-date version in your LexisNexis digital library. If you'd like to read a prior release of a title, you'll need to check it out. After you borrow an eBook, go to your Checkouts page and select Prior Releases. 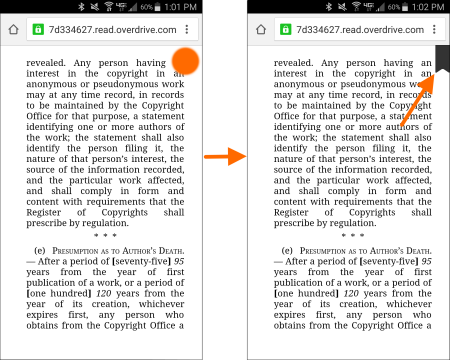 You can open a prior release in your browser using OverDrive Read or download it using the OverDrive app for offline reading. Note: Some releases may not have both Read and Download options. With OverDrive Read, you can borrow eBooks and read them right in your browser. You don't need to install an app or download files; all you need is a compatible web browser. To start using OverDrive Read, borrow an eBook that's available in the OverDrive Read format from your LexisNexis digital library. Then, go to your Checkouts page (under your Account) and click or tap the Read button. The book will open in a new tab in your browser. Click or tap the right or left edges of the eBook to turn pages. Click or tap and hold a word to define it, add a note, or highlight text. On larger screens, click or tap the bookmark icon to save a bookmark. On smaller screens, tap the top-right corner of the screen to save a bookmark. Click or tap a linked word or passage to go directly to that chapter or section. Select (in the bottom-left corner) to return to your previous position in the eBook. Select (in the top-left corner) to print the page. On a larger screen, use the display buttons at the bottom of the screen to switch between a one-page and two-page display. You'll find the menu icon in the top-left corner of the reader. Overview: Read a summary of the eBook, as provided by the publisher. Search: Look for a word or phrase in the eBook text. Contents: Browse the eBook's contents and quickly jump to chapters or sections. Bookmarks: View the bookmarks, notes, and highlights you've placed in the eBook. Select one to return to that part of the book. History: View a list of places you've visited during your current reading session. You add entries to this menu by searching, scrolling, selecting a chapter, or opening a link. Reading Settings: Adjust the eBook's text size, font, justification, and line spacing. Tips & Secrets: Find advanced tips and tricks for using OverDrive Read. To print a page from OverDrive Read, click or tap the middle of the screen, then select the printer icon. Note: Depending on the eBook, the current page(s), the current chapter, or several chapters may print. We recommend using your browser's print preview feature to ensure you only print the pages you need. You can also print your bookmarks and highlights from the Marks menu if you still have the book checked out, or access and print all of your notes and highlights from your LexisNexis digital library website. To copy a passage from OverDrive Read, click or tap and hold a word until the highlighter pops up, then drag to select the text you want to copy. Click or tap Copy to copy the highlighted section. You can then paste the copied passage wherever you need. Note: If you don't have Flash installed or enabled, a "Copy to clipboard" box may appear. To finish copying, select and copy the text in the box.. Define to look up the word in the dictionary. Highlight to add a colored highlight or make a note. See below for more information. 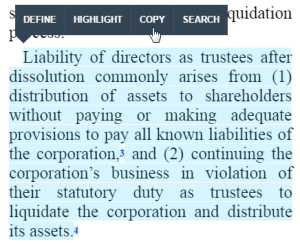 Copy to copy the highlighted text. Search to find other places where the word or phrase appears in the book. After you click Highlight, you'll be able to choose between three highlight colors and, if you'd like, leave a note. If you don't want to change your highlight color or add a note, click or tap anywhere outside of the highlight options. Or, to cancel a highlight, select the X on your current highlight color. You can find bookmarks, highlights, and notes in the Bookmarks section of the OverDrive Read menu. From there, you can select a saved bookmark, note, or highlight to open that section of the eBook, or select Print to print everything in the Bookmarks section. With OverDrive Listen, you can borrow audiobooks and listen to them right in your browser. You don't need to install an app or download files; all you need is a compatible web browser. To start using OverDrive Listen, borrow an audiobook from your LexisNexis digital library. Then, go to your Checkouts page (under your Account) and click or tap the Listen button. The audiobook will open in a new tab in your browser. Click or tap the Play/Pause button to start or stop the player. Swipe left to right on the book jacket to rewind. Swipe right to left on the book jacket to jump ahead. The farther you swipe, the further you jump. Note: This feature is only available in Safari and Chrome. Click or tap on the book jacket to show the skip and play buttons and hide the timeline. Use to add bookmarks, highlights, and notes to an audiobook. Click or tap the button to switch between common playback speeds. Drag down on the button to select a more precise speed. Click or tap the button to set a five-minute sleep timer (by default). Drag down on the button to select a longer sleep timer and make it your default. 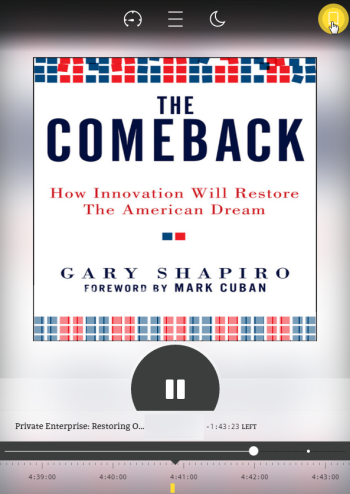 Use the seek bar to move backward or forward in the audiobook. You'll also see chapter breaks, bookmarks, and highlights on the timeline. You'll find the menu icon at the top of the audiobook player. Overview: Read a summary of the audiobook, as provided by the publisher. Chapters: Browse the audiobook's table of contents and quickly jump to chapters or parts. Bookmarks: View the bookmarks, highlights, and notes you've placed in the audiobook. 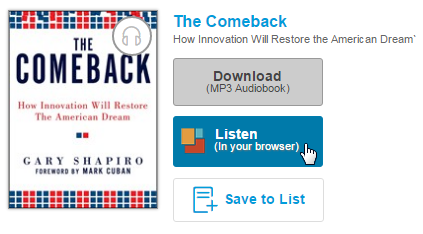 Click one to return to that part of the audiobook. History: View a list of places you've visited during your current listening session. 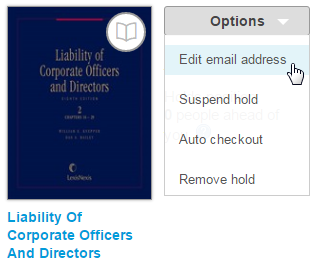 You add entries to this menu by searching, scrolling, or selecting a chapter. Tips & Secrets: Find advanced tips and tricks for using OverDrive Listen. Quickly click or tap to add a bookmark. Hold while audio is playing to record a highlight. When you release , the highlighter colors will appear. You'll also be able to Make a note on a highlighted passage or a bookmark. You can remove a bookmark or highlight from the Bookmarks section of the OverDrive Listen menu. To do so, click and drag or swipe from right to left on a mark and select Remove. You can download eBooks and audiobooks for offline use in the free OverDrive app. 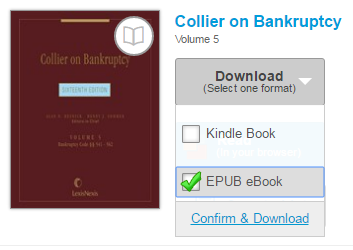 You can also download eBooks using the Kindle Book option (U.S. only) on your LexisNexis digital library. Note: For the best experience, we recommend reading eBooks with OverDrive Read for added benefits like access to notes and highlights after the eBook expires, the ability to print pages, and more. Learn more about OverDrive Read here. Download the OverDrive app from your device's app store or from app.overdrive.com. The app is available for iOS (iPhone/iPad/iPod touch), Android (including Kindle Fire, Kobo, and NOOK tablets), Chromebook, and Windows 8 and up. Sign into the app and find your LexisNexis digital library. When you select the library, it will automatically be saved in the app so you can easily return to it. Note: Make sure to search by name, because your LexisNexis digital library may not appear in the search results if you search by location. 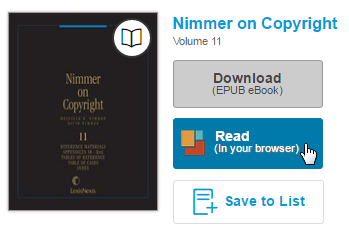 Sign into your LexisNexis digital library, go to your Checkouts page (under your Account), and download the title. For eBooks: Select the EPUB eBook format from the Download drop-down menu, then select Confirm & Download to add the eBook to the app. For audiobooks: Select Download (MP3 Audiobook) to add the audiobook to the app. Return to your app bookshelf. Tap or click a title to start reading or listening. Learn more about the app and its features here. You can download most eBooks to Kindle devices, the Kindle Cloud Reader, or the free Kindle reading app (available for most devices). 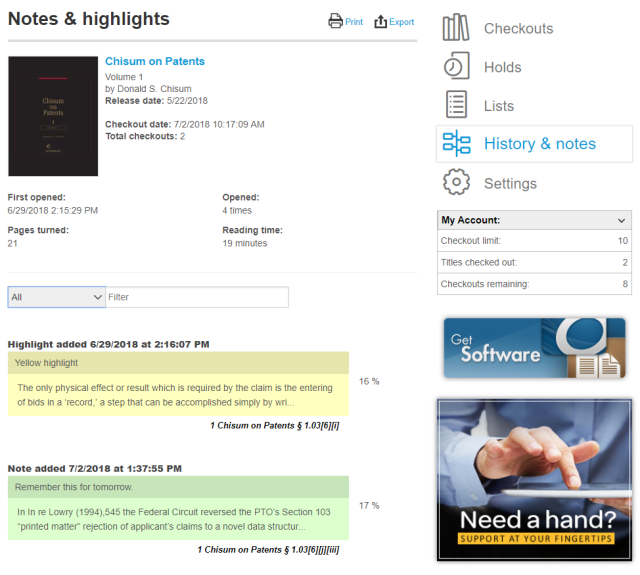 Sign into your LexisNexis digital library and go to your Checkouts page (under your Account). 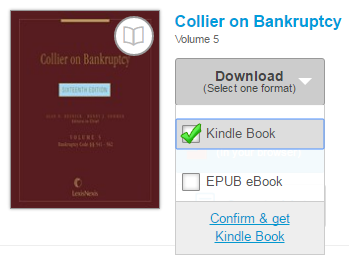 Select the Kindle Book format from the Download drop-down menu. Then, select Confirm & get Kindle Book to be taken to Amazon's website to finish sending the eBook to your device or reading app. Learn more about sending eBooks to Kindle. If a title is unavailable, you can place a hold on it and receive an email when it's available for you. If you need a title as soon as possible, you can make an urgent request, which, if approved, places you at the front of the wait list for that title. 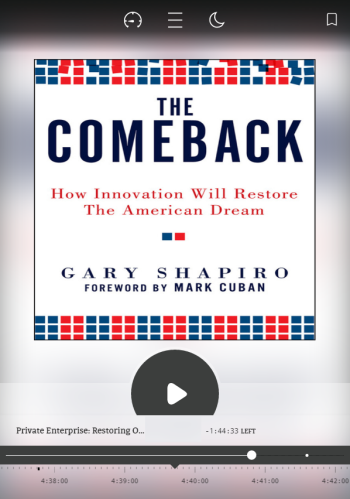 Unavailable titles have grayed-out format icons in the top-right corner of the cover. Use the instructions below to place a hold, submit an urgent request, or borrow an available hold. Select Place a Hold underneath a title. Or, click or tap beneath the title, then select More info to open its details page. From there, select Place a Hold. Note: Urgent requests are granted at your library administrator's discretion, and some requests may not be approved. If you need access to a title as soon as possible, place a hold like normal. Then, on the hold's confirmation page, select the Urgent request button that appears and send the email that opens. If your request is approved by your library administrator, you will be placed at the front of the wait list for the title. If you urgently need a title you've already placed on hold, follow the steps below to submit an urgent request. Go to your Holds page (under your Account). Select Edit email address from the Options drop-down menu for the title. Select Update. Or, if you'd like, you can edit your email address for the hold notification email first. On the update confirmation page, select Urgent request and send the email that opens to complete your request. If your request is approved by your library administrator, you'll be moved to the front of the wait list for that title. When the title you placed on hold is available, you will receive an email letting you know that it has been automatically borrowed for you and that you can find it on your Checkouts page. 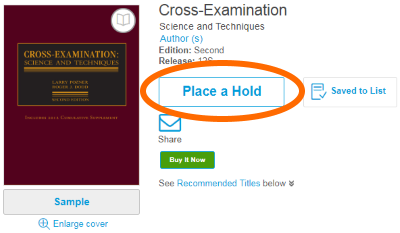 Follow the link in the hold notification email, which will take you to your Holds page in your LexisNexis digital library. Select Borrow to check out the title. Note: If you've already borrowed the maximum number of titles from your LexisNexis digital library, you will be unable to retrieve your hold (even if you've enabled automatic borrowing) until you return a title or a title expires from your Checkouts page. Where can I find my checkout history? Your History & notes page (under your Account) lists all the titles you’ve borrowed since 16 June 2016. Where can I find my notes and highlights after an eBook expires? To see notes and highlights you've left in OverDrive Read eBooks, go to your History & notes page (under your Account). From there, select the Notes & highlights link next to the title. To see your notes and highlights from a prior release of an eBook, select Prior Releases, then Notes & highlights next to the release date. Note: Only notes and highlights you make in OverDrive Read will be available on Notes & highlights pages. 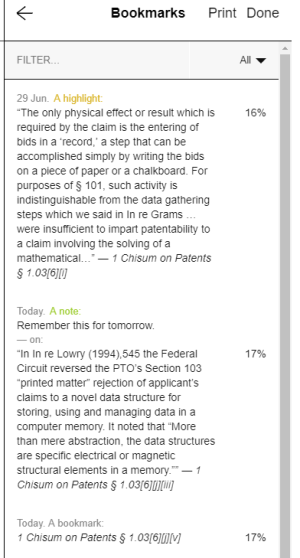 On the Notes & highlights page, you'll see any passages you highlighted in that title, any notes you wrote, the colors of the highlights, and the citation for the passage. 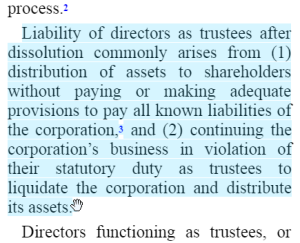 Note: You might not see the entirety of a highlighted passage or note, depending on its length. To see the full passage, you'll need to open the book in your browser. 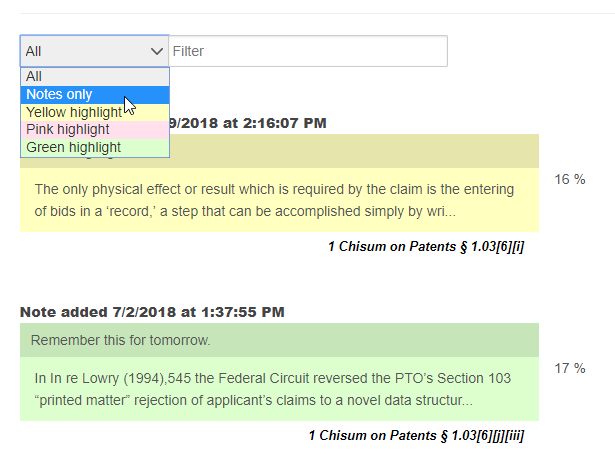 You can filter your notes and highlights to see a certain highlight color or only highlights with notes. You can also use the Filter to find a word or phrase within your notes or highlighted passages. Use the Print option near the top of the page to print your entire Notes & highlights page. Or, to access your notes and highlights when you aren’t at this site, select the Export option near the top of the Notes & highlights page. When titles expire, they are automatically returned to your LexisNexis digital library. If you'd like to return a title early to make space in your account, use the sections below to learn how. Note: You can't return any titles using OverDrive's desktop app for Mac. 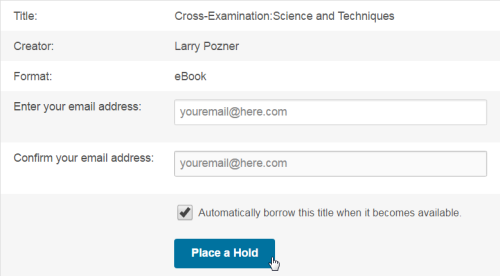 You can also return titles from your LexisNexis digital library. Just select the Return Title button below the title on your Checkouts page (located under your Account).